Zunar, one of Malaysia’s well known cartoonists recently called on Muslims and most particularly Muslim artists around the world to make works about the Prophet Mohamad in light of recent protests that took place around the Islamic community worldwide after an anti-Islam film was poste on YouTube that insulted the religion and the Prophet. The man known also as Zulkiflee Anwar Haque or fondly referred to as Zunar said that Westerners, who are usually unaware of the rules of Islam would continue to produce films, cartoons and works of art that directly or indirectly mocks and insult the Prophet Muhammad will continue to do so and hence, there is a need for Muslim artists to take the lead. 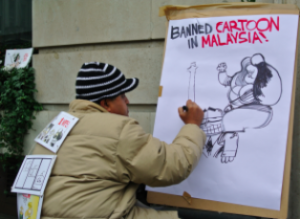 Zunar was presented with the Annual Award for courage in Editorial Cartooning in 2001 by the CRNI (Cartoonists Rights Network International). He was also no stranger to controversy when he was arrested and detained in 2010 by the authorities while his cartoons were banned for all media. He would then publish 5 volumes of his cartoons in a booklet form to continue airing his views on issues in the country. Zunar joined the choruses that condemned the film but said that protests will not prevent any further publication of detrimental material but instead will push the producers to make more. Hence, he called on Muslim artists including producers, film directors and cartoonist to produce more works of the Prophet from the Islamic perspective so that people will be educated and know the issues related to Islam.